This week is Brain Injury Awareness week #BIA2017. 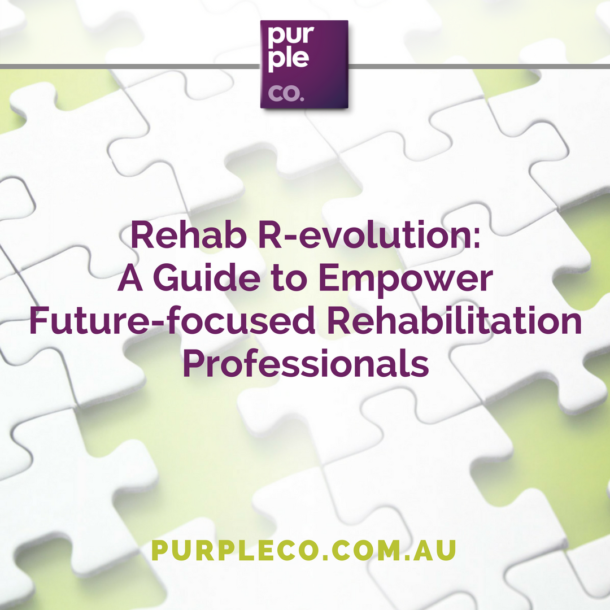 We at Purple Co have been providing services to people who live with injuries to their brains, and the functional consequences of these injuries, since the company started in 2008. What has been interesting for me, and for other Rehabilitation Professionals to acknowledge is how vastly different each experience of brain injury is. This is so much more than a severity rating. It’s the personal and psycho social implications of the types of behaviours that result following a brain injury. This might sound like common sense; however, it may surprise you to learn that we are consistently having to educate and train referral sources that every person and every brain injury will be very different. It’s hard to imagine, but I have had a conversation with a claims assessor who advised me that after 4 years of working with a client who had a severe brain injury, that he must have been malingering because she had worked with a client in the past who was “fine” and back to work without support after 3 months post brain injury. I was rather aghast at this statement, and it got me thinking about how much we don’t talk about this type of “hidden” injury and that we have a lot of perception and mis information to deal with. This was consistent across all people involved in the study and did not appear to depend upon the severity of the injury. When we think about the impact of common functional limitations such as memory, concentration and attention many people think that all that is required is the use of memory aides. And while memory aides are a valuable resource, there is more than memory aides required when we are helping people to not only return to work but also remain employed when they are living with a brain injury. What we as team have noticed which is supported by the research, is that clients who struggle with memory impairments may forget important times, directions, meeting times, people’s names despite having worked in the same place for 3 years, instructions, workflow processes, deadlines, timeframes or the use of tools. Imagine what it would be like for you to come to your desk in the morning; and not know how to access the primary data base that you use every day; and then once accessed you may forgot the third step of a 5 step process, and that 3rd step changes the outcome of what you need to do so in fact you are making mistakes all the time because you don’t understand that you have forgotten step 3. Imagine not having the memory skills to be able remember that you have forgotten these steps, this workflow or this process every single day. This is not an uncommon occurrence for people returning to work with brain injury, and this is not uncommon for people who have been rated as having a mild or moderate impairment as opposed to experiencing a significant impairment. Interruptions to memory is much more prevalent that the complete loss of memory, which many people tend to expect. We hear unhelpful things like – ‘if he can remember X then why can’t he remember to do Y’. Another favourite I have heard from an employer was, if he can learn how to drive and be allowed to drive then he can certainly be able to follow our safe operating procedures. This type of commentary and expectation is unhelpful and humiliating for clients who have expressed to us that this leaves them confused and ashamed. Feeling that there is something inherently wrong with them, more than just having an injury to their brain. The client’s self talk becomes, I am wrong, I am no good, I can’t work and no one wants me. How people interact at work is of equal significance to memory, concertation and planning. And emotional regulation and the ability to read the emotional cues of others is often a significant functional limitation for people living with brain injury. In this day and age where social and emotional intelligence is becoming almost like a new literacy, how we assist clients living with a brain injury access and maintain employment is becoming increasingly challenging. I have worked with many clients where we can teach skills; implement memory aides; provide structured feedback mechanisms. Yet despite knowing and working with a person with a brain injury for years, coworkers still become less able or willing to cope when there are angry outbursts, tearfulness or when an inappropriate joke is told in an effort to feel a sense of belonging. Skills we can teach, emotional regulation in the moment, that’s not so easy. According to the The World Economic Forum – The Future of Jobs, emotional intelligence will be one of the top 10 job skills in 2020. This is going to be a significant barrier for people living with brain injury. Take a moment to think about these. What do these reasons require to be successfully executed? They require emotional regulation. Clients who struggle with emotional regulation will likely be disciplined, up to and including termination . Arman and McMahon  explained that Anosognosia, which is a lack of awareness of one’s deficits, can contribute to problems with emotional dysregulation. “A person cannot take steps to correct a problem that he/she is not aware of, even when presented with feedback”. Therefore, common and traditional approaches to feedback giving in the workplace is not going to be successful for employees who struggle with this specific issue. A common theme for me in helping people with a brain injury remain at work is there appears to be a “bubbling up” of these largely unquantifiable, non-technical difficulties. Employers, managers and coworkers lack the knowledge and the language to be able to express why they are becoming increasingly irritated by the person with a brain injury. Yet the client living with the brain injury is possibly engaging with more and more unhelpful behaviours because it is all they know how to do. I’ve seen it time and again, where an employee’s technical performance cannot be faulted but their ability to “fit in” or embrace the culture of the workplace has been sufficient reason for termination. As Rehabilitation Professionals, we have some work to do. We need to embrace SEOI skills as a part of our helping clients prepare for work. We need to be aware of not only memory, attention and concentration limitations, but also increasingly aware of how our clients present, how they interact and how we can help them moderate their behavior in a workplace to allow them to not only return to work, but stay at work. If you or someone you know would like to learn how Purple Co can assist with developing skills, strategies and a plan for a person living with a brain injury remain at work, please reach out to us. We would be more than happy to talk about how we could help. Jo is all about connecting people to purpose through inspiration and innovation. She has grown a successful allied health practice Purple Co, a truncation of Purpose for People. Jo graduated from the University of Sydney in 1994 with a Bachelor of Health Science, Rehabilitation Counselling and is a sought-after speaker, trainer and coach. Work is such an incredibly significant part of our life, yet for so many of us work is hard and leaves us feeling exhausted, unwell and in extreme cases unable to earn at all. Jo and her team use their expertise in human behavior to help people to make their work, work well for them. Jo knows that work is not all of who we are, BUT without work our health, our wealth and the ability to live a fulfilled life can’t be realized. Helping you return to work following injury, illness and trauma. Sustainably managing change and transition even after forced change such as illness, redundancy, downsizing, retrenchment. Building personal capacity and resilience as foundation for creating success in the 21st Century workforce. Mapping, planning and implementing how to make your work, work well.